Sick call is the primary way to access health care during incarceration and lays the foundation for meeting inmates’ constitutional rights to adequate health care. Sick call must be timely, clinically appropriate and responsive to the health needs of inmates making requests for care. Sick call is a high-risk, high-volume and frequently problem-prone aspect of the health care program and should be monitored as part of the continuous quality improvement process used at the facility. 1. Set thresholds: This is the first step in monitoring any aspect of health care. By keeping track of the volume and timeliness of sick call it is possible to set norms for each step in the process. So for example if a unit receives and triages an average of 50 sick call requests each day starts to receive 90 requests a day will know to investigate the reason for this deviation from the norm. It could be that there is a new nurse assigned to sick call or there is an infectious disease process like influenza being transmitted or perhaps the nurse isn’t being responsive to the inmates’ concerns and they are submitting additional requests in the hope of a referral. When inmates are concerned about violence on the unit (such as an impending riot) one sign is an increase in use of sick call. Noting average utilization rates is one way to identify potential problems when the rate is greater or smaller than the norm.In addition to average rates of sick call, activity goals or standards for performance should be set to compare actual performance to the goal or desired level of performance. An easy example of a threshold is that 100% of all requests for sick call attention will be reviewed by a nurse and triaged within 24 hours of the request being received. Another threshold is that 100% of all requests that have a symptom based complaint will be seen by a nurse in a face-to-face encounter within 48 hours of the request being received. These are compliance indicators for NCCHC’s essential standard on access to care (E-07) so a threshold of 100% is preferred. Another example is that all nursing sick call encounters will document that patient education was provided. In this case the threshold may be less than 100% and represent a goal to be attained by the nursing staff. A final example where a threshold less than 100% might be set is patient satisfaction. 2. Identify problems or opportunities for improvement: Efficient, effective and clinically responsive services are goals of quality health care. The table below outlines aspects of sick call that are monitored against established thresholds to evaluate how well the program meets CQI goals. Connected to this post are three audit tools that were developed to monitor the quality of sick call. Click on the link set up below for each tool. The link will open another page then click on the link on that page and the audit tool will open up. Perhaps one or more of these tools can be adapted for use at your site. Some facilities also keep a log to monitor timeliness of sick call and referral care. Many times logs are put in place because the facility has a history of not providing timely access to care and an external tracking tool is found to be necessary. Entries on the log record the date and time the request is received, triaged, and the face-to- face encounter takes place. Also recorded is the nature of the request, the diagnosis, and the disposition. If the disposition is referral to a clinician the date the appointment is requested as well as the actual date the appointment occurs is recorded. Fortunately with automation of scheduling and health records systems these logs take less work to maintain. Deviations from established timeframes and failure to provide timely care can be identified and remedied quickly if when the sick call log is reviewed daily. 3. Improve sick call services: Problems with access to care or opportunities to improve sick call services are easy to identify if the services are regularly audited and input from staff involved in delivering the service sought out. Nursing staff meetings should regularly include review and discussion of sick call and the results of CQI audits. The ideas staff have about how to fix a problem or make sick call better are critical to achieving solutions that are practical and sustainable. The Plan-Do-Study-Act Cycle is a simple four step method to make changes that will correct or improve sick call. The first step is to select from among several possibilities one change to try out. Next pilot the change to see if it makes a difference. The pilot should be small in scale so it is quick and easy to accomplish. For example if the nurses think their productivity could be improved if all the equipment needed for sick call were in one place, a small test of change would be to outfit one room and then see if the nurses using that room for sick call are more efficient. The third step is to study the effect of the change by reviewing the results. In the example about the equipment being in one place the evaluation could be the time it takes a nurse to see five patients compared to others or how many patients are seen in an hour of sick call. Staff input at this stage is very important too. One question to ask at this stage is what has been learned about sick call as a result of the pilot. The fourth step is to take action based upon what was learned from the pilot that tested the change. If no improvement was noted or it proves impractical select another solution to test out through the cycle. 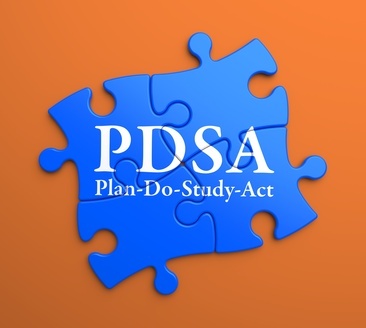 If an improvement is achieved begin to incorporate what was learned on a wider basis and continue to monitor the outcomes of the change through the PDSA cycle. How is data used to improve sick call at your facility? Nurses involved in sick call should also collect and monitor the data that drives improvement in access to care. Do the nurses at your facility discuss sick call at staff meetings to find ways to correct problems or make improvements? Do you have a sick call audit tool that you would like to share with other correctional nurses? Please share your resources and experience by responding in the comments section of this post. This entry was posted in Sick Call and tagged Catherine Knox, correctional nursing, Essentials of Correctional Nursing, jail nurse, prison nurse. Bookmark the permalink.